The Verdict: The Deserve® Pro Mastercard has a work hard, play hard vibe, catering to people with good credit or better who like to travel, dine out and generally have a good time. You get 3% cash back on travel and entertainment, plus 2% cash back at restaurants. That’s a pretty good deal, but it only applies to the first $500 you spend in those bonus categories each month. All other purchases yield just 1% back. So you might want to consider using Deserve Pro solely for bonus-category spending. There’s no annual fee, which means you don’t have to spend a certain amount for it to pay off. And 1% back is just average for a cash rewards card. The Deserve Pro Credit Card certainly isn’t perfect. It doesn’t offer either an initial rewards bonus or a 0% introductory APR on new purchases. Its regular APR is likely to be well above average. And it doesn’t even allow balance transfers or cash advances. But that just means it’s not for everyone. Below, you can find all the information you’ll need to decide whether the Deserve Pro Card is right for you. You can also check your latest credit score for free on WalletHub to gauge your odds of approval. 2%-3% Cash Back in Bonus Categories: The Deserve Pro Card will give you 3% cash back on travel and entertainment as well as 2% back at restaurants. But those earning rates end once you spend $500 in those categories, total, each month. Once you cross that threshold, you’ll earn 1% cash back on bonus-category purchases until the next month. For context, the average cash rewards card offers just over 1% back on all purchases. 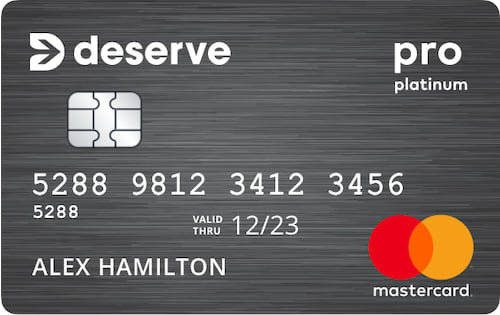 No Annual Fee: This makes the Deserve Pro Mastercard $17.35 per year cheaper than the average credit card. That’s obviously a good thing, especially if you don’t plan to use it every day. No Foreign Transaction Fee: You won’t be charged extra for making international purchases, whether you’re traveling abroad or buying something from a foreign merchant. The average credit card adds a fee equal to 1.50% of what you spend. No Sign-Up Perks: The Deserve Pro doesn’t have an initial rewards bonus or a 0% introductory APR. You can check out the market’s best credit card deals for offers that excel in those categories. High Regular APR: You need at least good credit to get the Deserve Pro Card. And since the card’s regular APR is assigned based on your creditworthiness, it figures that people with barely-good credit scores will get a rate toward the high end of its advertised range: 18.49% - 25.49% (V). However, the average credit card for people with good credit is much cheaper, charging about 20.31%. The low end of the range doesn’t compare favorably with the average credit card for excellent credit, which charges roughly 14.41%, either. The moral of the story is that you should only apply for the Deserve Pro Credit Card if you plan to pay your bill in full every month. If you’re going to carry a balance from month to month, there are credit cards with far lower interest rates to consider. No Transfers or Advances Allowed: You can’t transfer a balance to the Deserve Pro Card or use it to withdraw cash from an ATM. But you can compare balance transfer credit cards and learn how cash advances work on WalletHub. Average Rewards on Most Types of Purchases: You will earn just 1% cash back on purchases that don’t qualify as travel, entertainment or restaurant-related. The same is true of purchases in those bonus categories once you’ve crossed the $500 monthly limit. For context, the average cash rewards credit card gives you slightly more than 1% back on all purchases. So if you can qualify for Deserve Pro, you should be able to earn more by doing the bulk of your spending with another card. Best for People with a 700+ Credit Score: The Deserve Pro Credit Card requires good or excellent credit for approval. And based on the approval rates we’ve witnessed, across all cards, that means you need a credit score of at least 700 to have a good shot. You can check your latest credit score for free on WalletHub. Does the Deserve Pro Credit Card deserve your business? You need to know what else is out there to answer that question. So to help you out, WalletHub compared it to some of the top alternatives offering rewards in popular spending categories.